One of the very important decisions that mothers of infants have to make is regarding what type of diapers to use for their babies. This is indeed a vital decision as not every child can be comfortable with the same choice. There are many products available in the market that cater to this particular need of a child. However, they are different in terms of sizes, material and so on and one may suit an infant better than another. Usually it is a process of determining the most suitable one by trial and error, that is, a mother has to keep on using various pampers until her baby and she, herself is satisfied with one of them. A famous brand of diapers is Pampers that is owned by Procter and Gamble. Rather, diapers of Pampers are so popular that in many parts of the world, people refer to diapers as Pampers only; the brand name has become a generic name! Two products of Pampers are Swaddlers and Baby dry. Both of these are very good with respect to absorption and keep the infant dry as well as comfortable. However selecting one of them is necessary depending on a number of factors. To begin with, the two vary in terms of absorbency. Both absorb very well but the method by which they absorb varies. Baby Dry claims up to 12 hours of dryness for your baby. This is very useful if the diaper is used for long periods such as long trips or for an overnight period etc. 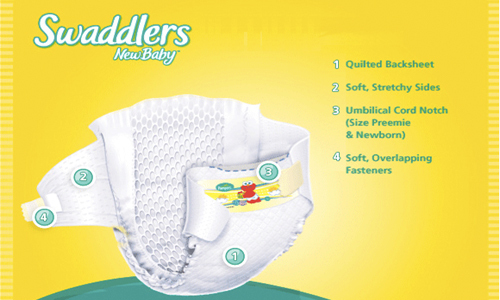 Swaddlers, however, unlike Baby dry, makes use of a new innovation in absorbency which is termed as Dry Max. This is an absorbent gel that is inside the lining of the diaper. It works by sucking up moisture very efficiently. It is even more efficient than the absorbent fluffy pulp that is used in other diapers. The fitting of a diaper is very significant. The better the fitting, the lesser the chance of leaking although occasional leaks are possible regardless of the quality of the diaper being used. New-borns are very small and diapers sometimes just do not fit them well. It is quite common to observe gaping at the legs or sometimes around the belly. Keeping this factor in mind, Swaddlers is the better option as it fits more snugly around the legs of the infant. Moreover, the new-born size that is available in exclusively Swaddlers features a cut-out for the infant’s umbilical cord stump. More than anything else, this is a measure of comfort. Some parents do get concerned about the top part of the diaper irritating the stump of the infant. The material used and hence the feel of the two types of diapers also varies. Swaddlers are softer than Baby dry. The reason for this is that these diapers are targeted to be for new-borns and very young infants who are highly sensitive to fabrics against their skin. A layer is found in Swaddlers that is a soft, mesh layer. It touches the baby’s bottom, creating separation from their looser stools. Such a layer is not present in Baby Dry; these are meant for slightly grown up infants and they do not have so loose stools. The use of a mesh layer would be useless. Keeping in mind the above mentioned differences, it becomes important to make a decision regarding which one to use. Swaddlers, due to the factors covered above, are the better option for new-borns. However, they do not come in any size above 2, and as your baby grows old, you will have to switch to Baby dry. allana. "Difference between Swaddlers and Baby dry." DifferenceBetween.net. November 25, 2014 < http://www.differencebetween.net/business/difference-between-swaddlers-and-baby-dry/ >. There’s actually size 3/4/5 of swaddlers too.